Hello! Claire here, back with the latest instalment of my Real Bride Diary. Over the last year, I’ve been popping in with small updates every couple of months, on topics like how we found our venue, how I chose my wedding dress, and what to do when wedding planning gets a little bit too much! Now that we’re under the six-months-to-go mark (eek! ), I’ll be updating you guys on all our planning a little bit more often, both to keep you abreast of how it’s all going (lending my tips and insight along the way), and kind of selfishly, for myself, so I don’t loose track and realise there’s only two weeks to go, and we haven’t sent out the invitations yet! So, to crack on, today I’m going to share how we chose our wedding food, and include a few tips for anyone who’s yet to hit that stage in their planning. January 5th, 2106: Five Months, Three Weeks and Two Days To Go. – My current obsession: Personalised napkins and matchbooks from Etsy. – Mark’s current obsession: Scanning our guests’ playlist choices. – This month we’re mostly: Thinking about our ceremony, and finding just the right shade of grey for our linens! 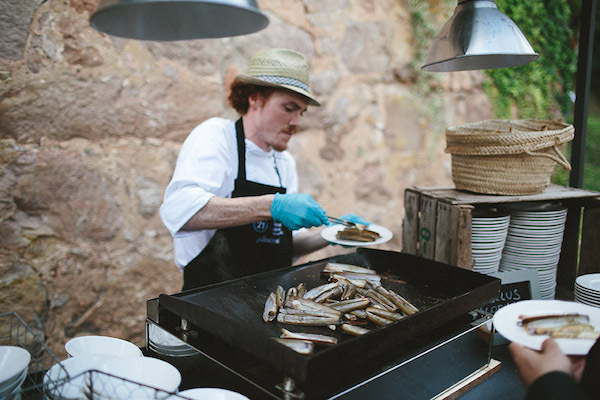 So the food was up there in importance with our top four elements of our wedding (along with the venue, the band and the photography! ), and our choice of venue was very much made with the catering options in mind. One of the reasons we chose to get married in Kilruddery was because during the summer, they throw weekly suppers with the produce from their own working farm and gardens. 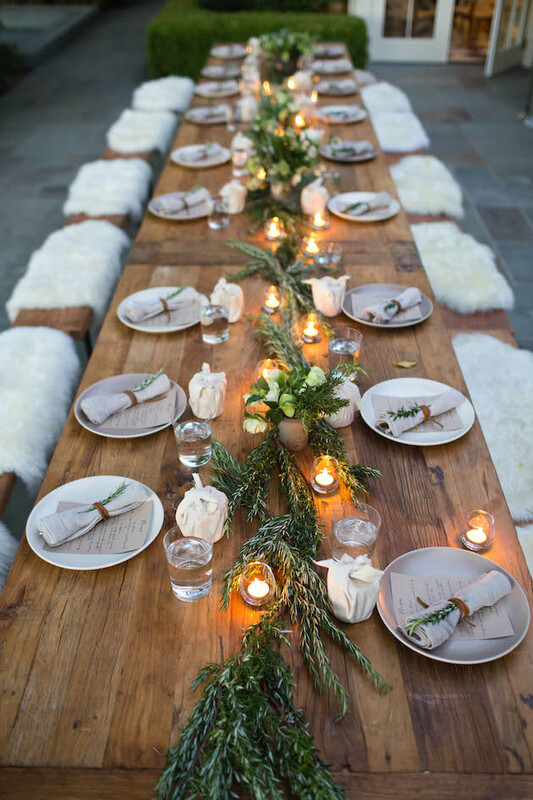 (Farm to table is a big wedding food trend at the minute!) Because of this, we knew they would place as much importance on the quality of food as we do. While we didn’t know exactly what we wanted to serve, we were sure it wouldn’t be formal dining. If you know Marko and I, we’re pretty casual people. If someone comes for dinner at our place, it’s normally something relaxed, that requires everyone to muck in (think fajitas or DIY pizzas), when we eat out, we love tapas, and in the summer you’ll find us in our local BBQ park with some burgers (veggie for me!) on the go. So for us, we only looked at venues that would offer either a BBQ menu, or family style serving. My tip: Before you even look at venues, sit down and work out the kind of feel you’d like from your food. What you serve and how you serve it can dictate the whole feel of your reception. So, What Are We Serving? We were determined to have a few unusual and personalised touches throughout the day with our food. And while we weren’t quite sure how we’d be able to do it, we’re so glad that we’ve found ways to move things around and add a sense of fun to our day from the very start. This is perhaps my favourite detail from our wedding so far! On one of our visits to Kilruddery, we saw that they had an old school ice-cream cart. As we’re having an informal ceremony (more on that in a post soon! 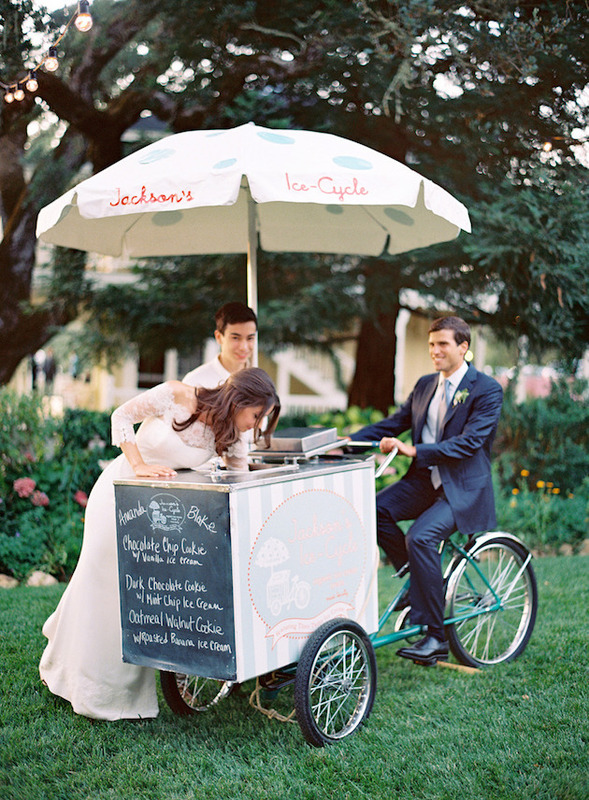 ), we thought it would be so cool to greet our guests with a cup of ice-cream as they take their seats. My tip: I think it’s such a welcoming gesture to offer your guests something as soon as they arrive (as you would if they visited your home), whether it’s a drink or a sweet treat, it instantly makes them feel relaxed, and well looked after. For our cocktail hour, we did some rejigging of the menu on offer at Kilruddery. While they had lovely canapes on their list, they were a little more formal than we were hoping for. So, we asked them if we could take something from their late night menu instead, and now, we’ll be serving our guests fish and chip cones as they chat and mingle. It’s so great to be serving food on our day that feels a bit more ‘us’. As for the cocktails, we had our hearts set on margaritas, (we were drinking them the night we got engaged!) and bought some nice dispensers that we thought would be perfect for them. But unfortunately, when they were priced up, margaritas were way out of our budget, so Kilruddery are going to make a (less potent!) 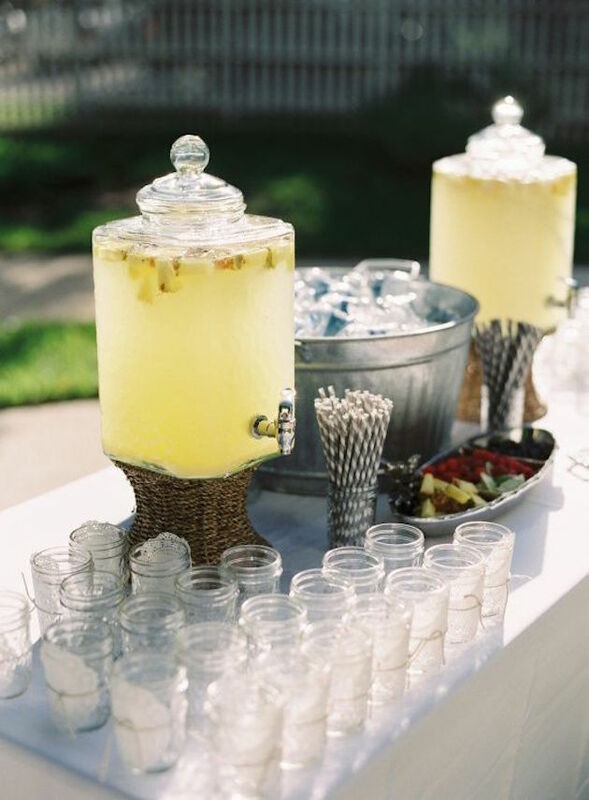 summer punch instead, that will still look great with our dispensers. We’ll also be serving craft beers and ales at cocktail hour, for those who’d prefer it. At an Irish wedding, it’s not customary to have an open bar. As cliche as it is, the bar tab at an Irish wedding probably runs a lot higher than entire wedding budgets in other countries! So, we’ll serve a couple of welcome cocktails, followed by wine and beer with dinner, and then the bar will open up. My tip: Make sure you ask about corkage before you book your venue/caterer, and double check you can bring your own wine. Even with a substantial corkage, we’re still saving a small fortune by bringing our own wine for the wedding reception. So, for our reception dinner, we’ll be serving a seated starter (shallot parcels, I think, yum!) and then we’ll be having a buffet BBQ for the main course. We were really tempted to go for something super casual for this (burgers and chicken skewers) because we knew they’d be prepared really beautifully. But then, despite our best efforts to keep things casual, we did give in (a little bit!) to the occasion that’s in it. It’s still a wedding day, and let’s face it, the most expensive meal we’ll (hopefully!) ever pay for in our lives, so it requires something a little special! So we’ll be serving beef brisket, sea bream, and a Mediterranean vegetable dish for the veggies, not totally fancy, but probably a step up from burgers! They’ll come with a salad buffet, that sounds really fresh, seasonal, and delicious. My tip: As much as you want to put a stamp on your day, you do still have to pick crowd pleasers. For us, that meant avoiding dishes like pork, which many of our friends and family won’t eat. 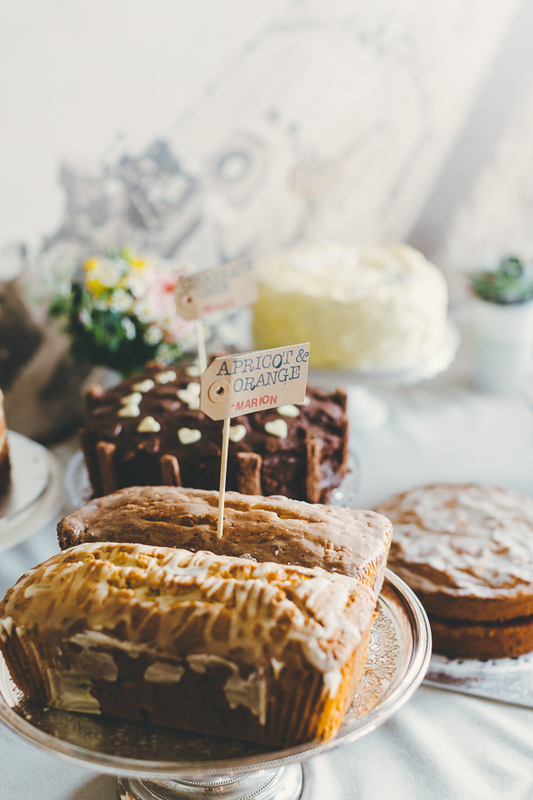 It’s so important to be mindful of your guests’ tastes and dietary requirements when you’re planning your menu. So, this was an idea I stole from last year’s keeper of the Real Bride’s Diary, Gemma (so feel free to pinch it from me!). Instead of set desserts or a wedding cake, we’re having a Great Wedding Bake Off! We chose to do this for a couple of reasons. Partly because as we chatted to different venues and caterers, they told us that they only ever serve up about half the desserts, and lots of them end up in the bin (I hate food waste!) because people are too full to have dessert straight after their meal. And thirdly, because we’re big bakers, we used to create all manner of weird sugary creations when we lived in Dublin, and we love the social aspect that comes with sampling eachother’s cakes, pies, cookies and brownies. We think it’s going to be a nice detail, something our more baking-inclined guests can have fun with, and will mean that the desserts can be enjoyed for a few hours, rather than simply straight after the meal. My tip: Check with your venue or caterer if there’s a cake or dessert table charge. And be sure to request that the bakers to let you know what they’ll be bringing with their RSVP, so you can have some little signs ready to go on the day. This is probably the aspect of the food I’m most excited about! At about 11pm, when the dancefloor’s in full swing, and all that craft beer is starting to kick in, we’ve got the guys from Dough Kitchen coming, who have a wood fired pizza oven in their trailer! How cool is that? So they’ll be on hand until about 1am dishing up pizzas to our guests, the band, and any vendors who are still burning the midnight oil. Choosing pizza was a no-brainer for us, and Dough Kitchen already work a farmer’s market in Kilruddery, so they were an easy choice (plus their pizzas look incredible!). Late night food isn’t 100% necessary depending on how late you’re dinner is, but it’s always appreciated, if you ask me! My tip: Make sure you keep your vendors fed too, your planner, photographers, band, bar staff etc, will all need to eat throughout the day, so be sure to include them in your head count when you’re giving your final tally to your venue or caterer. So there you have it, our food choices for our wedding, hopefully you’ve found them helpful/inspiring for your own big day. We’ve found it way easier having our catering in-house, though I have heard mixed reports on the cost-effectiveness of having an external caterer, so I’d love to hear your thoughts in the comments below! Check out the rest of my Real Bride Diaries.